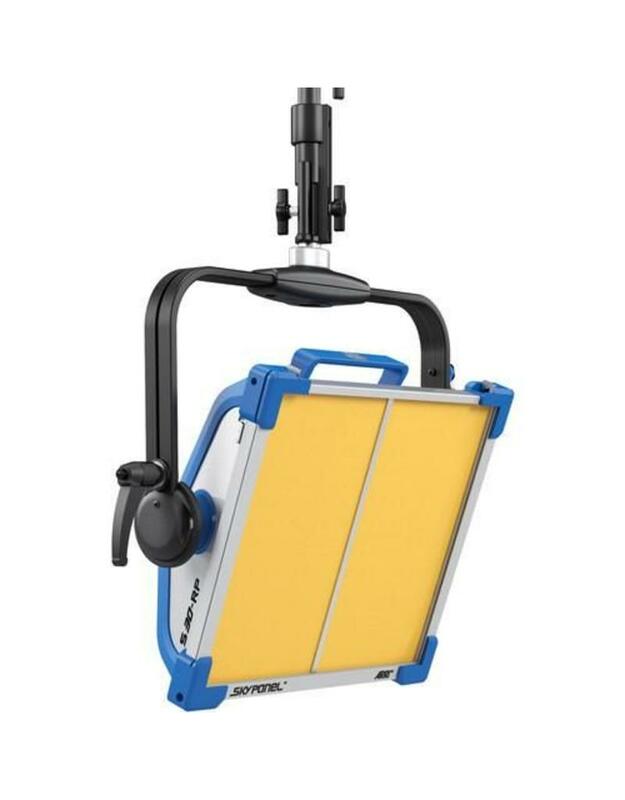 ARRI continues to broaden their LED line and reaffirm their commitment to accurate color rendering with the introduction of the blue/silver SkyPanel S30-RP Tungsten LED Remote Phosphor Softlight. 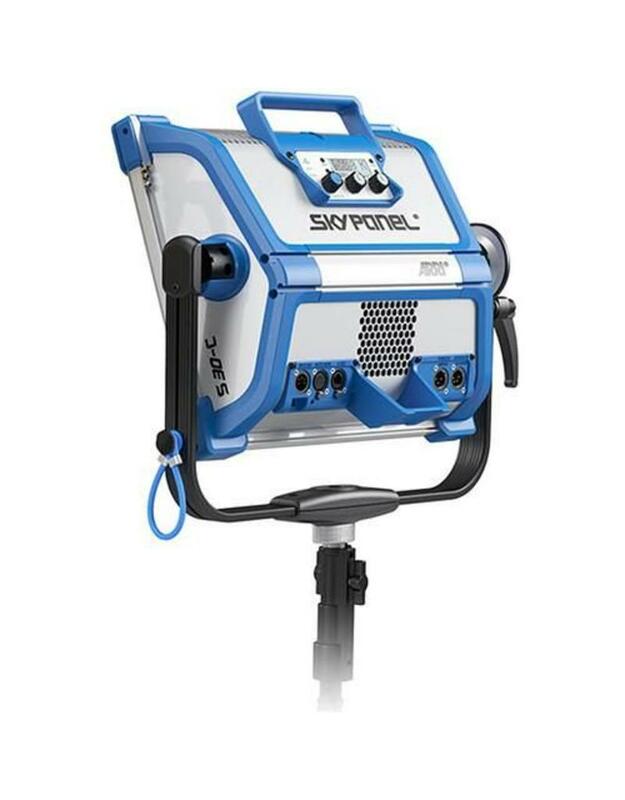 Supported by a pole operated aluminum yoke, the panel's surface area measures 14 x 11.8", making it an ideal portable, on-the-go light source for mobile applications. Output is controlled via interchangeable phosphor panels to achieve a specific Kelvin temperature instead of adding phosphors to blue LEDs. 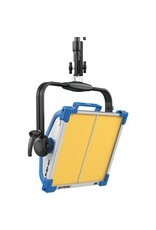 The powerful native LEDs then excite the phosphor panel that's mounted like a filter in front of the fixture. This method not only uses less electronics resulting in a lower price point, but delivers a color rendition that approaches current definitions of "perfection" and is 10% brighter than its color tuneable S30-C counterpart, which has an output equivalent to a 1000W tungsten softlight. Both versions of the light draw only 240W. This rendition of the light ships with a 3200°K panel with an impressively high CRI of 98, but optional 2700°K, 4300°K, 5600°K and 6500°K phosphor panels with CRIs of 93, 97, 98 and 98 respectively are available, as well as a Chroma Green panel. 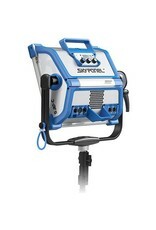 Dimming from 0-100% can be adjusted locally with the SkyPanel's onboard controller or remotely via DMX or over a LAN. Besides inputs and outputs appropriate to these functions, The light has a USB-A port for downloading firmware upgrades from a thumb drive, PC or Mac. 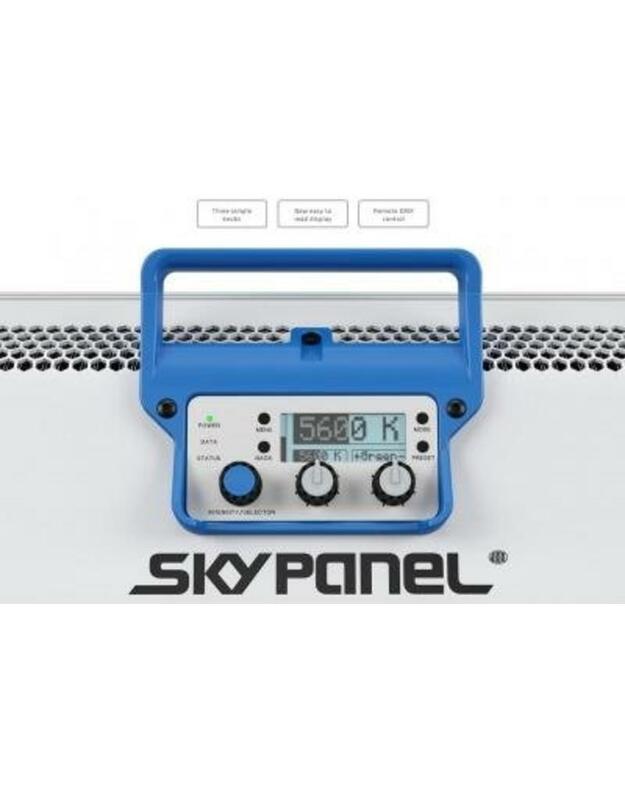 The SkyPanel S30-RP can be used worldwide, thanks to its included 90-250 VAC power supply but it can also use optional 23-36 VDC batteries when mains power is unavailable. Besides the power supply, the light comes with a combo baby/junior (5/8" | 1-1/8") pin and a standard diffuser. This version of the light comes with a 3.3'-long bare ends DC power cable. These high-quality phosphors deliver outstanding color rendition and outstanding light output. The remote phosphor versions of the SkyPanel are roughly 10% brighter than the color tuneable versions and have a lower price point due to less complex electronics. Different color temperature panels are available, including 2700°K, 3200°K, 4300°K, 5600°K, 6500°K, and Chroma Green. The SkyPanel produces not just impressive light quality, but excellent shadow rendering as well. The soft shadows cut cleanly without exhibiting multiple edges or color fringing. While the SkyPanel was designed to be used primarily as a soft light to illuminate people, various built-in features make it extremely adaptable to other uses. 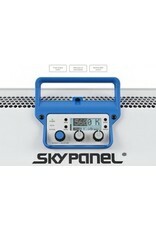 With the onboard battery input, SkyPanel can be run off industry-standard batteries. The S30 can be operated at full power on battery power. The SkyPanel also makes an effective space light outputting a large downward-directed pool of color controllable soft light through an optional silk cylinder. Made in Germany to the high standards for which all ARRI products are known, SkyPanel is constructed from resilient materials and assembled by hand with great care. The combination of an aluminum core with fiberglass-reinforced thermoplastics results in a solid fixture that can withstand heavy daily use on busy film sets. The easily-services electronics have been designed to last beyond a minimum of 25,000, up to a maximum of 50,000 hours while the LED light engine even allows for re-calibration. The SkyPanel user interface is designed for ease of use with a wide range of controls available to the user. In addition to the on-board controls, all functions can be remotely adjusted via DMX or LAN connections.